As has been true the entire century, both presidential campaigns believe that carrying Ohio is necessary to winning the election, and now both parties’ nominees have made campaign appearances at AICUO member institutions. 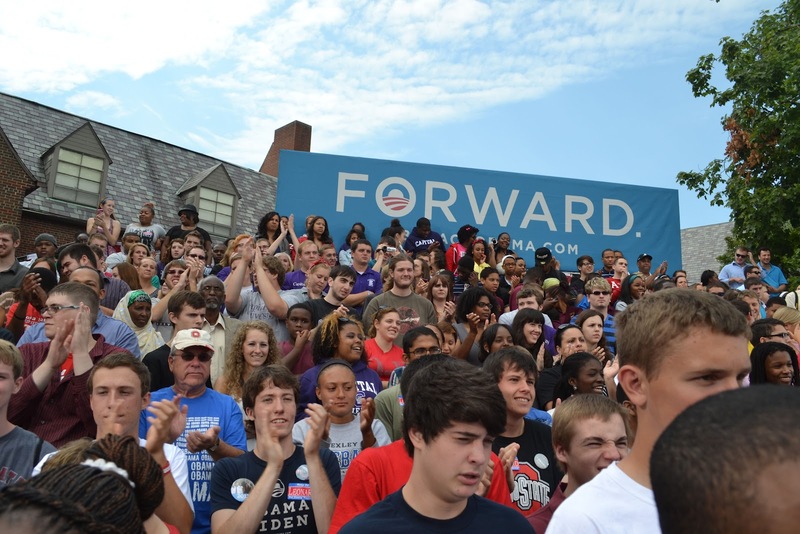 Tuesday, President Barack Obama made a major appearance before more than 3,000 supporters at Capital University in Columbus. Mr. Obama came as candidate rather than as president, urging students to support his re-election so that reforms to student loans, increases in Pell grants, and other higher education policy initiatives will continue. “Whether it’s a four-year college, a two-year program, higher education is not a luxury, it is an economic necessity that every family in America should be able to afford,” he told the crowd. The university provided more than just a location, the Saylor-Ackerman quad on the east edge of the campus. Junior John McClain, a member of the university’s Chapel Choir that recently won two gold medals at the World Choir Games, sang the national anthem, and senior Stephen DeBusk, a former BMX racer who had transferred to Capital from Columbus State Community College, introduced the president. Students were allotted seats in bleachers, while all other attendees had to stand for up to three hours until the president arrived. We expect to see more visits by both parties' candidates to Ohio campuses, public and private, before Election Day. 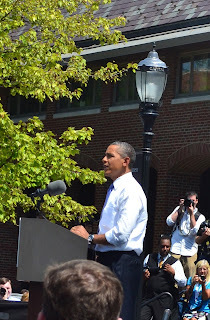 Tuesday the president sneaked a quick visit for lunch and informal chats with students at the new Ohio Union at Ohio State University; after the Capital appearance he headed off to Reno, Nev., for a similar talk at a community college there. Republican nominee Mitt Romney has already visited Otterbein University, and his running mate, Rep. Paul Ryan, recently held campaign visits at Walsh University and at his alma mater, Miami University. Labels: Capital Univ., Otterbein, presidential campaign, Walsh Univ.